Saudi Arabia is home to a number of different Arab groups. 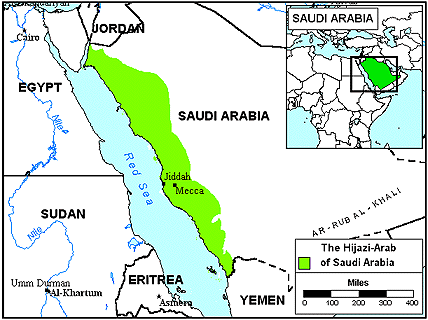 The Hijazi Arabs (more commonly known as the Saudi Arabs) form the majority of the Saudi Arabian population and live predominantly along the Red Sea coast and in the major urban areas. They speak a language called Arabiya, or, as it is more commonly called, Hijazi Arabic. The Arab culture was developed by tribes of nomads and villagers who lived in the Arabian Desert. From there, Arab migrations spread throughout the Middle East and northern Africa, leading to the expansion of the Arab world. More than half the area of Saudi Arabia is desert. Fertile oases, many of which are the sites of towns and villages, are scattered through the Saudi Arabian deserts north of Rub' al Khali. Larger tracts of grassland can be found in Ad Dhana' and the plateau region. The great Saudi Arabian oil fields are located in the coastal area adjoining the Persian Gulf. Historically, farming and raising livestock have been the basic economic activities of Saudi Arabia. Since the development of the oil industry, however, the government has sought to diversify its industrial base and improve its basic economic structure. As a result, roads, airports, seaports, and the power industry have all been developed. Through a sharp increase in oil prices beginning in 1973, Saudi Arabia began to amass a tremendous cash reserve. The government used its new-found wealth to transform its economy at a rate almost without precedent in modern history. Although there was a lack of trained and skilled labor, this was partially offset by millions of workers from other countries. Today, the government is the largest employer in Saudi Arabia, engaging about a third of the work force. Industry employs nearly the sam amount, including a small amount in the oil industry. Others are involved in trade and other services, and in agriculture or fishing. Education in Saudi Arabia is free, but not compulsory. Most of Saudi adults are literate, a dramatic increase from the less than 3% literacy rate in the early 1960s. In recent decades, teacher-training institutes have been established with the aim of reducing the country's great dependence on other Arab countries for teachers. Because Saudi Arabia has long imported food, agriculture has been targeted as a key area of development. Since the late 1980s, a large wheat surplus has been exported, and the country has achieved self-sufficiency in many dairy and poultry products. The lack of water has made a minimal amount of the land useful for farming. Irrigated lands located near oases have been virtually the only sites of cultivation. In accordance with their Muslim religion, Gulf Arab marriages are typically endogamous, which means that they marry only within a small social circle. Inheritance is patrilineal (passed down from fathers to their sons). Gulf Arab clothing is designed for the harsh desert climate. It is made of lightweight, light-colored fabric and is also loose-fitting, allowing for the circulation of air. The Hijazi Arabs are virtually all Muslims, but represent a variety of Islamic sects. The founding of Islam in the seventh century profoundly altered the course of Saudi history. In the mid-1700s, Mohammed ibn Abd al-Wahhab formed his fundamentalist sect, and today, the Saudis see themselves as the preservers of the true Islamic faith. The city of Mecca is the holy place of pilgrimage that all Muslims must try to visit at least once in their lifetime. Few of the Hijazi Arabs in Saudi Arabia have accepted Jesus as their Savior. A profession of faith in Jesus may cost a person his family, his honor, his job, or even his life. Evangelization of this group will be challenging, due to the nature of the Arabs' lifestyle and belief system. Prayer is the key to reaching them with the message of the Cross. * Ask the Lord to open the doors of Saudi Arabia to the preaching of the Gospel. * Ask the Holy Spirit to give creative strategies for evangelism to missions agencies focusing on Hijazi Arabs. 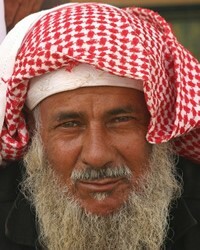 * Pray that God will give Hijazi Arab believers courage to share Christ with their own people. * Pray that strong fellowships of believers will be raised up among Hijazi Arabs. * Pray for the availability of the Jesus Film in the primary language of this people.View Arab, Saudi - Hijazi in all countries.